Modern system concepts tailored to Industry 4.0 or the IIoT offer numerous advantages in terms of process efficiency, costs and quality. The ultra-compact C6015 Industrial PC (IPC) is the ideal space-saving, high-performance IIoT edge device to fully utilise these advantages for new and legacy systems in the process industries. 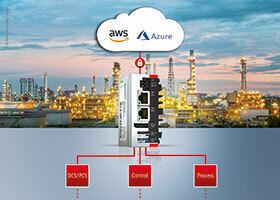 • A universal portfolio of components for explosion protection, including the ELX series EtherCAT Terminals, enables end-to-end automation of even large and complex processing plants. • The TwinCAT software platform offers specific interfaces and libraries for process technology, and enables convenient cloud integration via TwinCAT IoT and data analysis via TwinCAT Analytics in perfect synchronisation with control cycles. • A high-performance IoT edge device is available in the form of the C6015 ultra-compact IPC, a universally suitable machine control platform. Measuring just 82 x 82 x 40 mm, the exceptionally compact C6015 IPC with multi-core technology can be flexibly installed even in highly confined spaces. Equipped with an Intel Atom processor offering up to four CPU cores, the C6015 provides sufficient processing power for simple collection, processing and provision of process data and for the more complex tasks required of a modern IoT gateway. The Microsoft Azure certification of the C6015 underscores that the device is ideal for state-of-the-art Industry 4.0 applications. The C6015 is predestined for such communication tasks especially when retrofitting and connecting legacy systems. Existing process technology systems can easily be equipped with additional IIoT capabilities using this edge device, or they can be readied to meet future communication requirements. In this way, operators of process technology systems gain access to the full wealth of IIoT and analytics solutions supported by Beckhoff technology, regardless of the automation technology used – be it PC-based control or third-party control platforms. This reduces production costs, optimises product quality and improves the overview and transparency of all process workflows. In addition, system availability and productivity can be increased and cloud-based services used, for example, to implement predictive maintenance. TwinSAFE: consistently modular, scalable and distributed safety applications.